Today is the start of October and the run up to HALLOWEEN, my favourite time of year! To get us all in a spooky mood I decided to make some adult party treats, Black Magic Macarons with Nutella and Kirsch Cherries filling! I also designed these terrifying Halloween printable labels that I added to my macarons using a little blob of the filling. Preheat oven to 150°C/130°C fan forced. Line three baking trays with baking paper. Mix together the icing sugar and almond meal and sieve. Set aside. Using an electric mixer, beat egg whites and cream of tartar until soft peaks form. 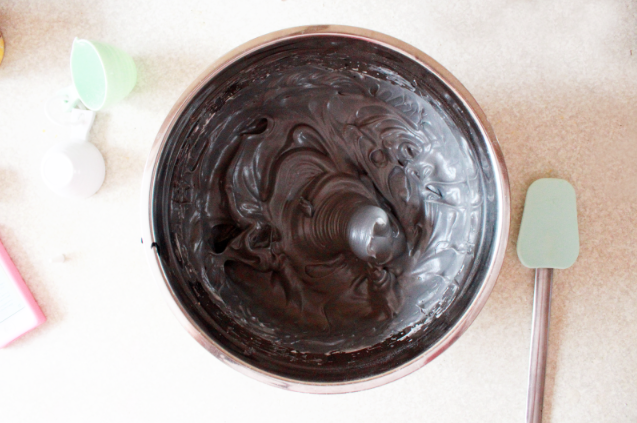 Gradually add caster sugar and black food colouring, beat until sugar dissolves. Fold in almond mixture in two batches, beating well. Spoon mixture into piping bag and pipe into 3.5cm rounds onto prepared trays. Tap trays on bench to remove excess air and stand 30 minutes. Bake 18 minutes or until just firm to touch; cool on trays. Divide nutella filling between macarons and sandwich together. To make the filling you'll need nutella (I used a tub) and added 2 tbsp of chopped cherries that have been soaked in kirsch. To thicken keep adding 1/3 cups of icing sugar 1 at a time until you can spoon the mixture into the macaron shells. Every time I make macarons I'm not very happy with the way they look. These looked impressive in my mind but they didn't come out black enough for me and once again they can out grainy even though I sieved the almonds! If you have any macaron tips please let me know as I'd like to make a perfect batch on day! But importantly they do taste great and when you have red glitter and white chocolate stars to decorate you can make anything look good! Pumpkin and Spiced Chai Sugar Donuts!